When Jessica from Joyfolie emailed me about her brown paper floors, I jumped over to her blog to check them out. Aside from the amazing shoe eye candy all over the place, I couldn’t help but notice that amazing finish on the riser. That’s when I knew it: I had been outbagged. I wrote her back right away saying I loved her makeover and that I was totally stealing borrowing her idea. The only place near me that I found paintable textured wallpaper was at Lowes. They have a limited selection, but I found something I liked in a medallion pattern (like a tin/plaster ceiling). This stuff is seriously cake to install-it comes pre-glued and all you have to do is wet it, let it get tacky for about 5 minutes, then put it up. Instant makeover! For $20 a roll (11 yards by about 2ft I think), you can’t go wrong. I may actually cover my entire house in it. If only I had known about this amazing product earlier, I wouldn’t have had to go through the trouble of cutting out hardboard to cover the risers in the first place. Remember this? Ugh! Well, I wasted no time in covering up my painted panels once I saw the light. Eventually I’d really like to add some picture frame molding to the bottom of the staircase walls and put this in the center of the frames. One day-when I figure out how to cut that angle- it will happen. Thank you again Jessica for sharing your brilliant idea with me! I love the look of this! I might just have to “borrow” this idea too. OMgosh!!! This is great ! Thank you for sharing!!! I have this exact same wallpaper on my ceiling! It looks great. I’m soooo tempted to put it up on our ceilings! Where do you get this wall paper? I am SO stealing this idea! It’s gorgeous! How have the stairs held up so far?? I love this idea! It is paintable too. I have used the anaglypta paper on altered book covers but never thought about it on my ratty ole stairs! It would even work on the sides of my stairs, which look just as bad…. Thanks fo the idea! I love this simple idea for risers, but am also wondering how they hold up? Do they scuff easily and are they easy to clean? 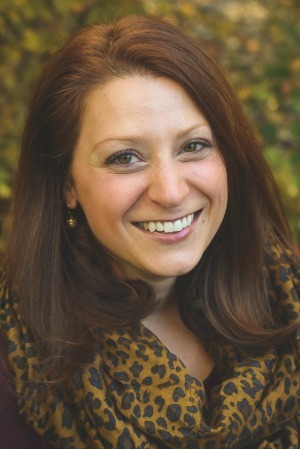 Renee- It probably depends on what paper you use, what color you paint them, and if you wear shoes in the house. Ours are holding up pretty well, could use some touch up paint here and there, but I’d imagine any painted riser (papered or not) would need to be touched up now and then as well. Hi! I just recently saw this post and gave the wallpaper a try. Its textured like yours. But to my dismay, it is soft.. tears super easy… so i decided to prime it with oil primer in an attempt to “harden” it. Otherwise, bc its an old house and the stairs arent as wide as they should be, people will ruin them quickly by scuffing them. Have you had it tear from scuffing? Did you have to put a primer or paint on it, and did that make it tougher? I did paint it (white), about 2 coats. Scuffing can definitely be an issue, so you might want to paint them a color that doesn’t easily show dirt. i acutally used this wallpaper to cover my backsplash in the kitchen! painted over it to give the pattern more definition. i cant wait to use the left overs for the stairs! I love it as a backsplash! I bet it looks awesome. I love this! I really want to do this in my home, but I am having difficulty finding a place that still sells wallpaper. any suggestions? Thx! I want to do this on my walls, however, I live in a mobile home. Do you think I will have any problems? I love this! What did you do on your stair TREADS? Is that wallpaper too? 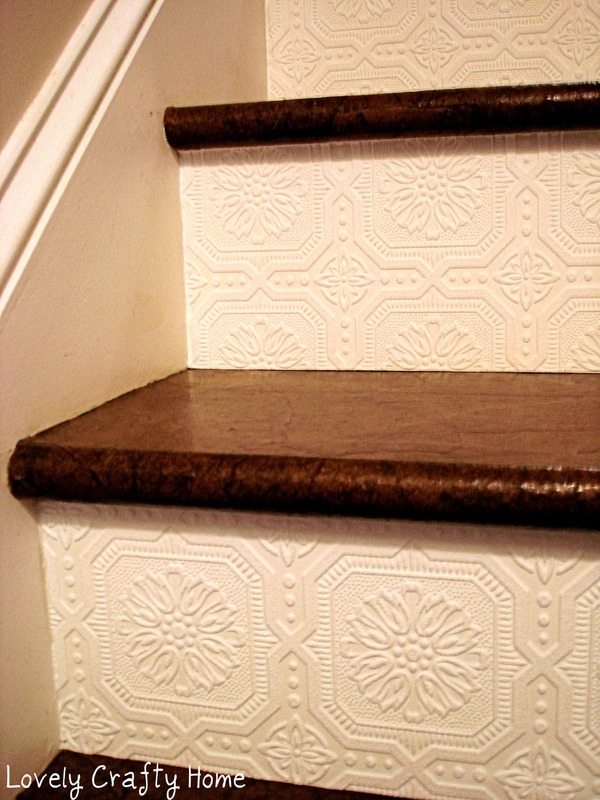 Do you even think wallpaper would hold up on stair treads? I am eager to hear your response because I have some very yucky looking stairs that really need a good makeover…like YESTERDAY! Thanks! Thanks for the quick response! I CANNOT believe that your treads are made of paper bags. They look so, so, so beautiful. Well done! I think that my stairs are particle board. Do you think this paper bag treatment would work on this kind of surface? 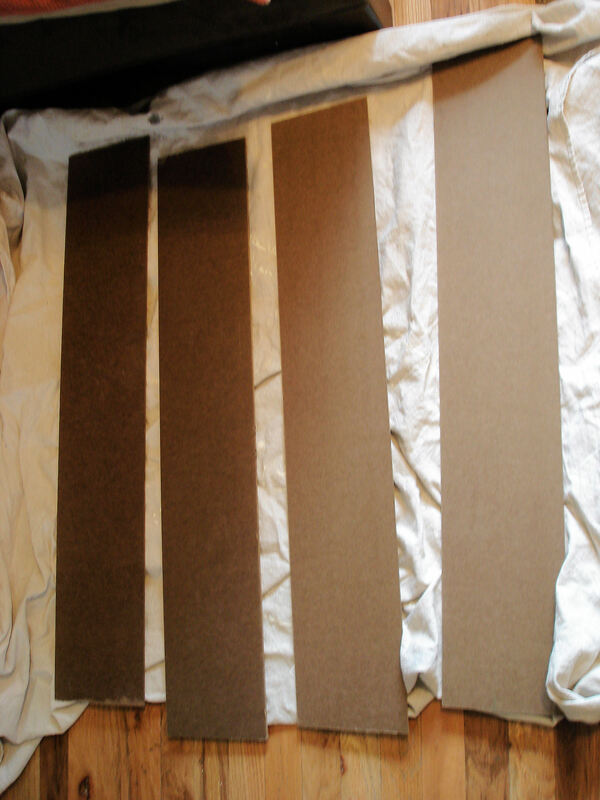 Michelle- my stair treads are MDF (vs the floor, which is plywood), I would imagine it would work on most types of wood/wood product…just be sure to try it on a scrap piece to check adhesion! Okay, I have read all of your directions and comments posted. So, if I understand correctly, I can do this on my stairs? I have cheap carpet and not a big budget. I can paper what is underneath carpet if I clean it up and sand as you did? I love it! It’s a great idea, if I ever have my own home I will “borrow” as well this idea. Thanks for sharing! I love this and we are in the same boat with the condition of the carpet on our stairs. My question regards the treads. Did you put new ones on – or clean up the existing treads that you had? I am afraid if I pull the carpet, I may find the condition of the treads pretty rough. We didn’t put new treads on (our house is only 5 years old), but generally I would think you’d be able to work with what’s there. If I was going to spend money to replace the treads, I’d forget about the paper entirely and put hardwood down to stain…if that makes sense. I would never use this product on any stairs in my house. I’d spend all my days re-painting it. Andrea- painted stair risers in general can be hard to maintain. It works for us though, we don’t have kids or anything and I touch them up every now and then. Not as often as you might think though! Did you paint the wall paper or did you just paste it on as is? Also did you find it to be very tacky? I want to do this and found the exact paper at Lowe’s but need to know if I have to buy paint too. I did paint it, I prefer the durability of a semi-gloss paint on top. In my old house, we painted one staircase with oil-based paints, and it held up well even through a major construction project! I think I’m going to try using oil-based paint on the paintable wallpaper! I can see this as an idea for a few things that need some help in my home. My door to my garage is scratched to high heaven and I was thinking of using wall decals on it but I like this better. Closet doors and door to the pantry or weathered kitchen island. Eveyone seems so creative. I have a psuedo star type design on my ceilings and when I moved in I didn’t know what it was when I I found a dusty rolll in the garage. So sorry it ended up in the trash. The front entry of our two flat has embossed/textured wallpaper on the lower half of the walls, framed in beautiful dark stained wood. It’s super durable in that high traffic area. It’s damaged now because someone bashed the wall in a few places (a stroller or grocery basket got out of control I think), but we plan on replacing it with new textured paper because it looks so fab. I have a clothes hammer that we rec’d as a wedding gift, 49 years ago. It needs a makeover and I had planned to spray paint it with a primer and then a coat of white spray paint but last night when I was “tossing & turning” trying to go to sleep, I thought about this type of wallpaper and wondered why it wouldn’t work. There is already a design from the vinyl covering that covers the front and sides from the manufacturer. It would serve the same purpose I think. Worth trying it and if I ever wanted to change the color, that type of wallpaper can be painted. You can purchased that textured wallpaper at Home Depot or Lowe’s. Do you think it would work? The back of the hamper is like wicker so I know spray paint would work on that part.. Probably the spray paint would be less costly? Hi there. I love this idea. Did you paint the wallpaper first and then stick it on after it dries? Also, with the wall paper only being 20 inches wide, how did you cover the entire riser so seamlessly? 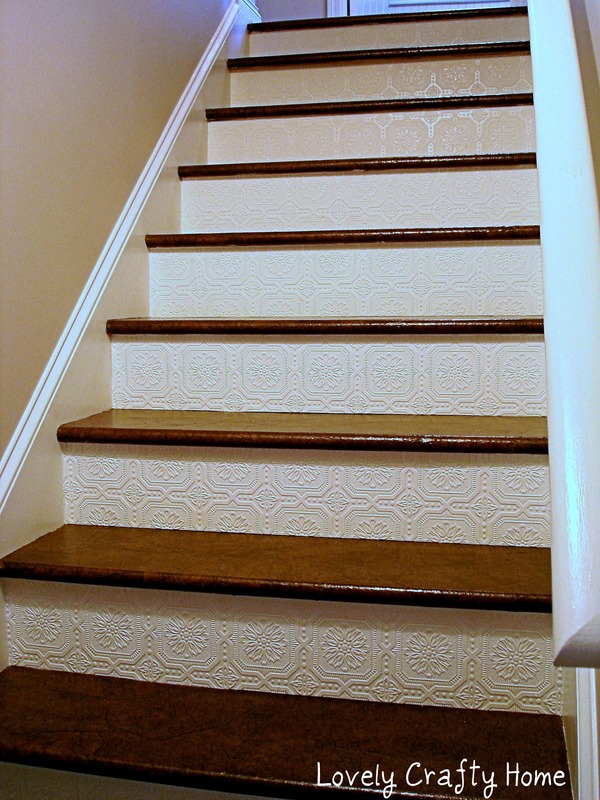 Hint…hint…textured, paintable, pre-glued wallpaper border fit my stair riser EXACTLY! Got it at Walmart…Better Homes and Gardens brand! 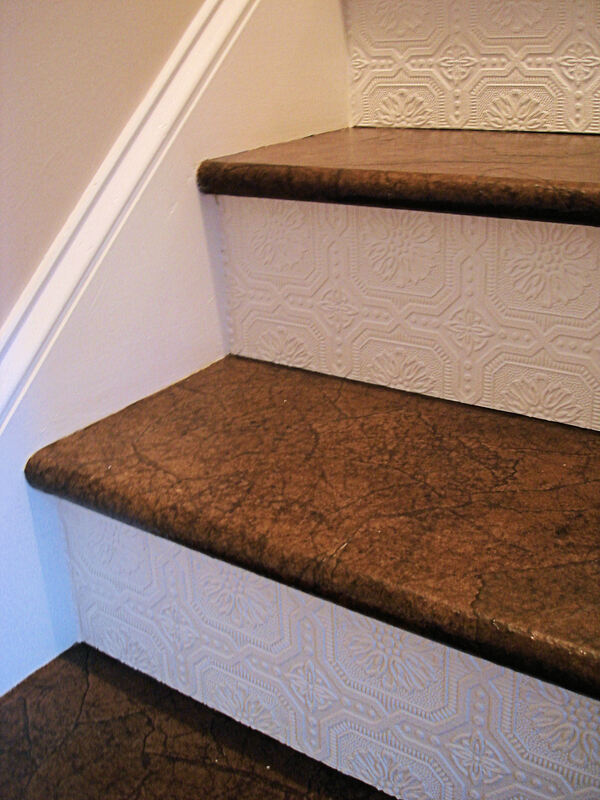 I did this to some of my stairs and absolutely LOVED the look….until we started using the stairs and found that the wallpaper chips off VERY easily. My 3-year old granddaughter just about destroyed them running up and down the stairs. Certainly not her fault! 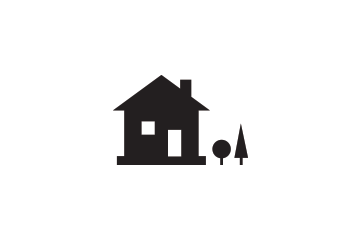 I’m now trying to figure out how I can get this look with paint and stencils. Wish me luck!